Ladies, do you enjoy making woollen garments but don't know how to get in touch with others who enjoy the same hobby? Then head to Knitter where you can talk all about your latest knitted garments... in 140 stitches or less. Budding comedians, have you ever wondered how you can get in touch with others in the same position? Wonder no more; just head straight to Titter where you can try out all your latest jokes... in 140 giggles or less. Of course, Titter might be confused with a similar titled social media site which refers to something else entirely; something which you might feel embarrassed to be looking at. I know I would be embarrassed if I was caught looking at pictures of small finch-like birds in public. Eaters of a particular form of unhealthy food, have you ever wondered how to share your ideas for deep fried battered vegetables, spam and mars bars? No problem. Fritter is there just for you and like minded lardies to talk about all your recipes and clogged arteries... in 140 calories or less. Council workers who are employed during the winter to clear ice from the roads, have you ever wanted to have a good old moan to others doing the same job for other councils? Then head to Gritter where you can complain away by sending them messages, or 'greets' as they are known in Gritter speak. Talking of winter, that's when the weather is at its coldest and we in Britain just love to grumble about how perishing it is. Well, specially for us Brits there is the perfect social media site known as Bitter. Of course, it might get confused with similar named sites aimed at beer drinkers and polite Germans, not to mention a certain group of people who like the colour orange and have a penchant for wearing bowler hats and listening to flute music. Finally, let's hear it for the media site which could be aimed at this very blog. Yes, another topic Brits love to discuss is toilet habits, so what better place to discuss everything related to bowel movements than the aptly named Sh*tter? Manchester United players have been banned from posting on social media from inside the changing rooms after Ander Herrera posted a video of him pretending to throw birthday cake into Juan Mata's face. Watch the 'incident' by clicking here. I’m sorry, but I can’t see any problem other than it being a rather silly bit of footage. Or is Man U embarrassed about how untidy the dressing room is? Honestly, socks, boots and shorts just lying around; absolutely shocking. Were any famous or notorious people born on the 6th of May? Of course. Here are some I’ve even heard of. Maximilien Robespiere 1758 (L’incorruptible. ), Sigmund Freud 1856 (Drug using misogynist polyglot with an oral fixation), Robert Peary 1856 (Arctic explorer who explored some regions he shouldn’t have, managing to father two sons on his expeditions even though he had a wife and daughter back home), Rudolph Valentino 1895 (The original screen idol), Stewart Granger 1913 (Ectaw. His real name was James Stewart), Orson Wells 1915 (Actor, director, writer and producer who produced his best work before the age of 30. Later advertised sherry. ), Bob Seger 1945 (Musician famous for his Silver Bullet Band. This week’s only musical link coming up. Here’s We've Got Tonight... apologies for the video quality), Tony Blair 1953 (Not a war-mongering megalomaniac), Graham Souness 1953 (Footy bloke. ), George Clooney 1961 (Actor. Played Batman, you know. ), Tom Hunter 1961 (Wealthy bloke) and Dani Alves 1983 (Footy bloke.). Centre-half Curtis Nelson ran through on goal from Rob Hall's backheel to hammer past goalkeeper Jayson Leutwiler in the 16th minute to open the scoring. And in the home team's next attack, Hall turned in Chris Maguire's cross from the left to make it 2-0. The hosts made the breakthrough in the 22nd minute when Jason Demetriou's right-wing cross was tamely headed out by Leon Barnett, enabling Stephen McLaughlin to drill a right-footed half-volley into the right-hand side of the net. The decisive goal came after 17 minutes when Harry Pell's cross was headed home by Danny Wright from six yards. A poor backpass from Carl Winchester presented Padraig Amond with a good chance to level, but Brown blocked well to ensure his side led at the break. Pell nodded a cross into the path of Wright, but he shot wide, and Hartlepool had appeals for a penalty turned down before Amond's cross was cleared at the far post by Liam Davis as Cheltenham were forced to defend. Brown was called on again to deny substitute Connor Simpson late on as Cheltenham held on. Jordan Moore-Taylor smashed in a 30-yard thunderbolt after 16 minutes, but Rovers were level in 26th minute when James Coppinger finished well from a tight angle. The Dons endured a frustrating second half attempting to break Exeter down, and the visitors regained the lead just after the hour. They were awarded a penalty when Joe Wright handled on the line, and although Ryan Harley saw his spot-kick saved by Ian Lawlor, David Wheeler drilled in the rebound. The win was sealed late on when Ollie Watkins squared for substitute Liam McAlinden to score. James Jones volleyed in front from 20 yards to put Crewe ahead when Argyle failed to clear George Cooper's corner. Luke McCormick then made a brilliant save to deny Cooper as the visitors pressed. Crewe goalkeeper Ben Garratt made a superb save to deny Blissett, and force a corner, but from the set-piece Argyle levelled when target man Ryan Taylor spun to redirect David Fox's shot into the far corner. Nate Blissett, who came on as a second-half replacement for Jake Jervis, powered home a header from Graham Carey's cross from the left to cap an incredible five-minute turnaround. Not too bad a result for The Grambler. The reason for the games being played at different times can be blamed on the fact that the end of the season is fast approaching and this week’s predictions could also be for games that are on at different times as English Championship games all take place at midday on Saturday the 6th of May and Division Two games all take place at 5.30. This is all down to the fact that these are the last matches for both divisions other than promotion playoffs. Indeed Division One games are now complete and only the playoffs take place this Saturday. That really is whopping. If it wins, I’ll eat my hat... I wonder where I can purchase an edible hat; just in case. Teaser time. Yay! Last week I asked you who the 1982 gates at Anfield were named after. 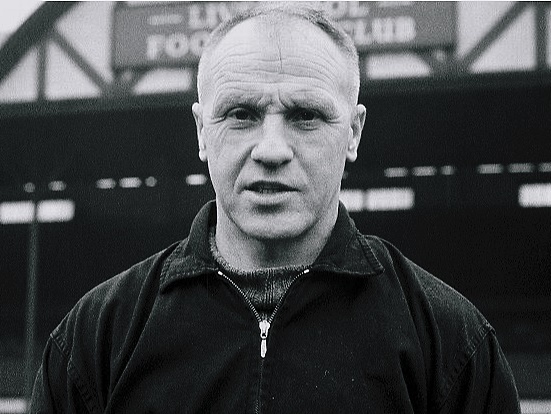 I am sure you all knew that they were named in honour of one of the club’s greatest managers, Bill Shankly. One for this week? Chris Hughton’s Brighton and Hove Albion have won promotion to the Premiershit. Brighton has been in the top flight once before, so this week’s teaser is, who was the manager when they were promoted on that occasion? And finally, Cyril? And finally Esther, I am indebted to a Mr W. Shankly, the answer to last week’s teaser, for this week’s concluding section. Shankly was a great football manager who gave us some wonderful quotes to remember him by. Here are a few belters to end this week’s edition. Football is not about life and death; it’s more important than that. ‘I’ve seen supporters on Merseyside going to the ground together, one wearing red and white and the other blue and white, which is unusual elsewhere. You get families in Liverpool in which half support Liverpool and the other half Everton. They support rival teams but they have the same temperament and they know each other. They are unique in the sense that their rivalry is so great but there is no real aggro between them. This is quite amazing.